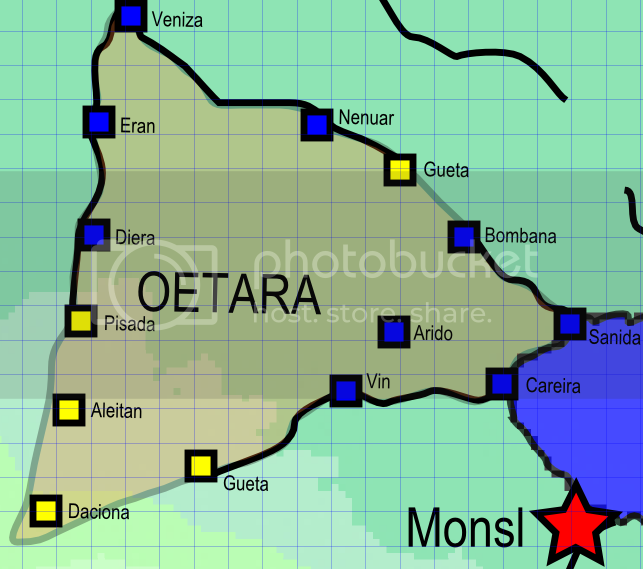 The following map shows the major cities and fortresses of Oetara. Cities are shown in blue, fortresses in yellow. - Situated at the western end of the Emperian heartlands, and the eastern end of the expansive grassland plains known as the Jarles. - The fertile lands of the Panestad lie to the north. - The land has natural boundaries along three main river systems: the Rubio along the southern border, the Xungu to the northeast, and the Orall-Tarr to the north. The western shore of Lake Pratall also forms a natural border. - Between the Tarr and Xungu, walled towns and fortresses guard the border to the north. This border is with other lands of the heartlands, and so is relatively lightly patrolled and defended. - The southwest corner of the province is hilly and sparsely populated. Despite the increased elevation, this area has been a traditional route of invasion by peoples farther to the west. The hills are gentle enough that the route is preferable to attempting to cross the wide waters of the Xungu. The hills are covered with light forests. - The capital of the province is Careira, lying on the shore of Lake Pratall, at the mouth of the River Rubio.